A side-by-side tutorial comparing two different methods! I've been drawing Celtic Knotwork for years and I have developed several techniques and my own methods. These tutorials demonstrate those methods. The first (left side of the page) is similar in some ways to the methods of George Bain, his son Iain Bain and many of the artists that preceded them. The biggest difference between my method and the traditional methods is that I use computer graphics programs, but the instructions below are applicable to pencil and paper as well. 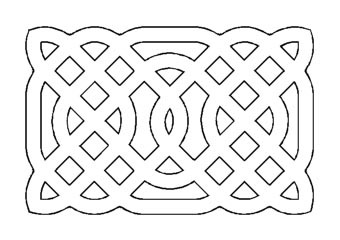 The second method illustrated here uses the Celtic Knot Font. This font is based on the same forms that can be created using the first method, but the knotwork has been cut apart into separate reusable pieces. I then converted those pieces into characters in a font. 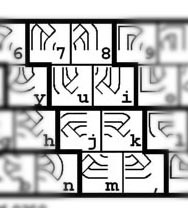 The pieces are linked to keys on your computer keyboard, giving you the ability to TYPE KNOTS! I realize that some folks may consider this comparison of methods to be biased because I profit from the sales of the font that is necessary for the second method. WELL THEY WOULD BE RIGHT! I AM BIASED! Even though I created it, I still use it a lot and consider it to be a very valuable tool. It makes the job of creating Celtic knotwork MUCH easier, allows for more flexibility in the patterns, and size, and the coolest thing about it is that the Celtic Knot font often surprises me by making patterns that I never would have thought of using traditional methods. It is actually lots of FUN! The first method illustrated here is the method that I used to create the font. I still use this method, as the font cannot create every knot imaginable (I am working on that!). But even when I am designing a custom hand drawn knot for a project I still start with the Celtic Knot font to get an idea of what sort of pattern I want in the finished knotwork and then re-trace or stylize whatever I created with the font. Please read this tutorial with an open mind and pay attention to how much time and effort this font can save. Everyone's time has SOME value, and if you can save a couple of hours designing one piece of knotwork then the Celtic Knot font will save you money every time you use it.. These instructions can be followed with pencil and paper or using any computer based drawing or drafting program. I have used Corel Draw, Adobe Illustrator, and AutoDesk AutoCad for various projects, but my favorite is Corel Draw. In the tutorial below I show the method that I use in Corel Draw; however, I have deliberately left out program-specific instructions. I did this to make the instructions more broadly applicable to work with as many drawing and CAD programs as possible. 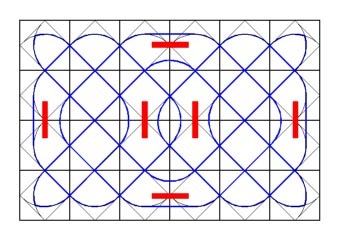 This method, like most, begins with drawing the grid. Of course you could use graph paper, but that would limit the size of your finished pattern to the sizes of graph paper that you happen to have available. 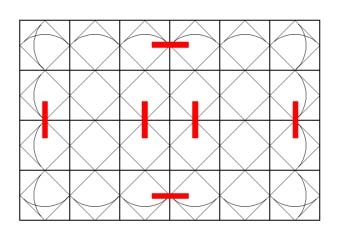 What size should you make the grid? Well that depends on what size you want your final pattern to be. If you are making a pattern for leatherwork, for instance, you would want to draw the pattern to be the size of the final project; say - wallet size. How many squares should you make? That is a tougher question. 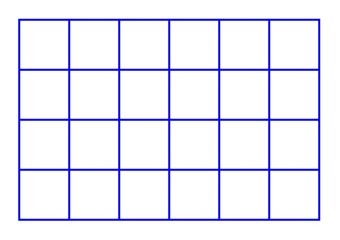 The number of squares depends on the pattern that you are going to make. The problem is that we often don't know what sort of pattern we want at this stage. So what do we do? Guess? Pick out a pattern that someone else created and copy it? We just have to pick a number of squares that fits into our final size and forge ahead hoping that the resulting pattern will look good and that we aren't wasting our efforts. This grid is 4 squares tall and 6 squares wide. The second step is to draw in the diagonals. These lines will be the path followed by most of the knotwork. 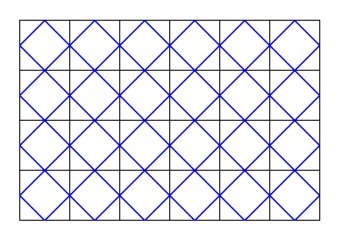 The diagonal lines must be drawn starting from the middle of the sides of the grid squares. In other words, don't draw the diagonals from the points of the grid squares or you'll end up with loose ends sticking out at all four corners. 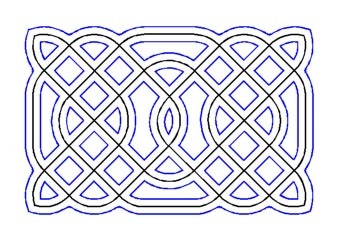 Next draw in the connecting curves that will become the edges of the knotwork. 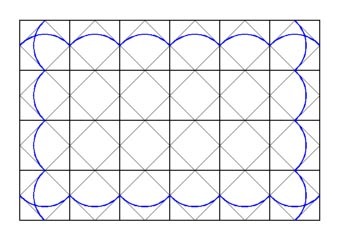 I make these curves tangent to the diagonals. In other words they connect smoothly to the diagonal lines. This is the step that most people have the most trouble with: deciding where to "Break the Grid". 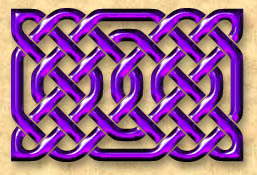 The thing that makes Celtic knotwork unique from the plaiting (or weaving) seen in many other cultures is the introduction of "BREAKS" into the weave. 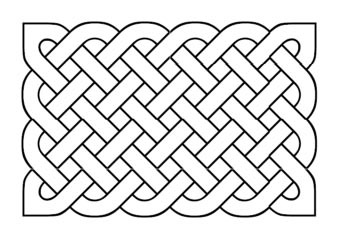 I've always found it to be rather fascinating: that Celtic knotwork is defined more by where the pattern ISN'T than where the pattern IS. It is a design form made of empty spaces within an otherwise solid object. So, where do we put these spaces to make an aesthetically pleasing design? A person with extraordinary visualization skills could probably imagine what a knot will look like, but for the average person it is a "try-it-and-see" sort of operation. 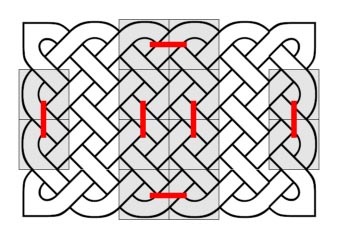 Here we find the biggest single problem with ALL of the traditional Celtic knotwork construction methods: you have to know what your knot is going to look like BEFORE you design it! 1). Copy what I did here (or someone else's designs from a book). But back to the tutorial. The red lines on our grid show where I am going to make my breaks. Follow the diagonals until you come to a red line. When you get to a red line, add a curve so that your line continues into the other line that is broken at the same place. Adding these curves completes the path of the knotwork. Darken this line so that we can see the path clearly for the next step. OK, now that you spent all of that time drawing the grid, the diagonals and the breaks, erase all of it except the knotwork path that we darkened in the last step. Here is what it should look like. For this step a computer graphics program comes in real handy. We need to make a new outline all around the entire knotwork path. 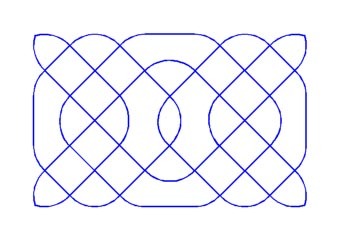 In Corel Draw you can combine all of the lines into one object and use the contour tool to make a line all around the knotwork path. In AutoCad you can use the offset function to make a line that is parallel to (but offset from) your existing lines. If you use Adobe illustrator you can create a custom pen type with 2 lines and stroke the knotwork path with your new pen. If you are doing this with a pencil you'll have to eyeball it. Draw a line all the way around the knotwork path and inside all of the little holes in the pattern. 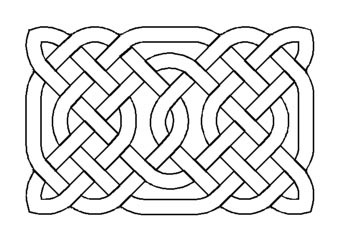 The new line should be offset from the original path by 1/2 of the desired width of the finished knotwork cord. When you are done with doubling the line, erase the original knotwork path so that all that is left is the outline. We're almost there! Hang in there just a little while longer and we will have a knot! And don't pay any attention to those smug folks that started the parallel tutorial at the same time that you started this one and finished making the same knot over an hour ago. You can be proud that you did it the HARD WAY! All that is left is to figure out the "Over / Under Thing". You can start anywhere on the path of the knot and make 2 little lines at each intersection. Be sure to alternate one way and then the other, over and under, until all of the intersections are done or until you run into an area where you find that you went OVER-OVER, or UNDER-UNDER. In which case you erase lines until you've eliminated the ones that are wrong and do it over. Look at the next illustration and you can see what I mean. Of course if you had used the Celtic Knot Font you wouldn't have to worry about the "Over / Under Thing" because that has been done for you already. So, there you have it, a completed Celtic knot! It looks pretty good. Of course I'm a professional graphic artist who has done this sort of thing for a living for over a decade, so your results may vary. Because I am fairly proficient at this, it only took me about 2 hours to make this knot for this tutorial. Now that you have read this tutorial, read the next one to the right to learn another method. There is no layout phase, no grids or diagonals to draw - just type those keys and you have this artwork! Many people stop here and think that they are finished. This really isn't Celtic knotwork yet. 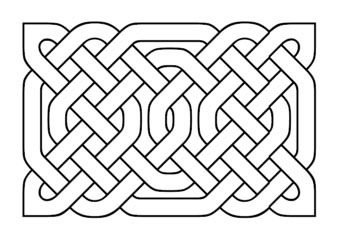 Read my rambling speech in the parallel tutorial for some of my philosophy about the breaks in knotwork. Without the breaks this isn't knotwork yet. So let's add some breaks, but first, scroll down because we are already way ahead of the folks in the parallel tutorial. OK, we need to figure out where to put the breaks. If you have read the other side you already know that I used the Celtic Knot Font to design the knotwork used for these tutorials. How did I do that? After I made the pattern above, I simply substituted pieces to see what looked good. I started in the middle of the top row and replaced 2 of the "w" pieces with "j" and "k"
How did know where those pieces fit? 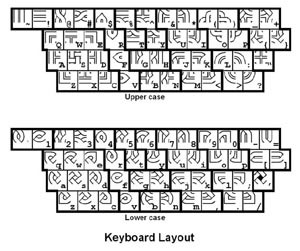 Well, aside from the fact that I made this thing and I know how ALL of the pieces fit, I could look at the keyboard chart that is included with every copy of the Celtic Knot font. Notice how similar parts are grouped together? Let's take a closer look. See how the "j" and "k" fit together to create horizontal lines? We can use them to replace the two middle pieces on the top row. I tried it and it looked good, so I did the same thing on the bottom using the "m" and "," keys. Similarly, the "7" and "u" and the "8" and "i" work together to form vertical lines. I used them to form the sides where I wanted straight lines in the knotwork. Notice that these are all pieces that work well on edges. So to make breaks, you just replace "Unbroken Pieces" with the equivalent "Broken Pieces". Here are the pieces that I need to replace (shown in gray) to get the same design as shown in the parallel tutorial. OK, I admit that I have an edge, by being extremely familiar with the font; but I can go through ALL of these steps in under 2 MINUTES without hardly trying! REALLY! Of course your results may vary! :) But even if you are really slow, you can design a Celtic knot in under 10 MINUTES instead of the 2 or more HOURS that were necessary for the old method. That gives you 1 hour and 50 minutes more time to work on the project that you wanted this knotwork for! Furthermore, your knots will look just as good as these; skill and artistic ability are no longer an issue! And if you are an artist, you'll have a lot more time for the really fun part, embellishing your knots in amazing ways now that the prepwork is done! Click here to get your Celtic Knot Font! If you used the method on the left and you want to change your knotwork, then you will have to start over . If you used the Celtic Knot Font method you can modify what you have. You can reuse sections and delete sections. Of course you could do that with a hand drawn knot, but by the time you are finished drawing the knotwork you're exhausted, drained and at your wit's end! With the Celtic Knot Font you are inspired and energized and ready to DECORATE THE WORLD WITH CELTIC KNOTWORK!